Despite Serzh Sargsyan’s efforts to form a new government, people in Armenia are still skeptical that he is ready for true reforms. He has done nothing to this end so far and will hardly do in the next year and a half. Here Sargsyan has lots of opponents - even in his own Republican Party. But their voice is not heard amid the chorus of supporters. The regime prefers following the beaten path. It is obvious that the appointment of Gazprom’s former top manager Karen Karapetyan as prime minister was a deal among different groups of the ruling regime. Sargsyan just ratified what his men had decided. The key message of this deal is that the Armenian authorities urgently need to change something or they will face a new bigger wave of mass protest. The only problem that they don’t know what and how to change. And one more question is if Karapetyan will stay in his office after the next year’s parliamentary elections or not. Sargsyan and his men are acting ad hoc and Karapetyan’s appointment has proved this. Sargsyan’s “national accord government” will hardly be efficient as his regime will continue acting the way it has acted so far. His policy is termed as “incrementalism” – when a regime makes just slight changes in its policy and presents them as a reform. But the reforms of the Armenian authorities are mostly situational, with the problems their people face regarded by them as obstacles to own reproduction. That is, the reason they solve problems is not because they want to cause improvements in their country but because they seek to remove barriers arising in their way. In this context, we would like to compare the internal policy of the Armenian authorities with their policy on Nagorno-Karabakh. Here they are seeking to solve the problem that caused the conflict - to give the Nagorno-Karabakh Armenians the right to be self-determined. As regards the consequences of the conflict – the security zone controlled by Armenian troops – they are inclined to solve this problem at later stages. So, while seeking self-determination for Nagorno-Karabakh, the Armenian authorities deny this right to their own people. The key reason why the Armenians are displeased is that they consider their authorities to be illegitimate as all the previous elections in Armenia have been forged. One of the ways for the authorities to restore people’s confidence might be to remove the political and social-economic causes of their displeasure but instead they remove the consequences. We wonder if any of the Armenian leaders can answer the question why in one of the poorest post-Soviet republics, people getting a monthly pension of just $85 are forced to witness the luxurious lifestyle of their prime minister and his ministers. This “material exhibitionism” amid growing poverty is a sign of social immorality. Such an illegitimate and insatiable regime is always afraid of true reforms. Karapetyan’s case is just one more example of Sargsyan’s incrementalism. Abrahamyan’s predecessor, Tigran Sargsyan, had just one mission – to feed the budget with western loans. Abrahamyan’s role was to act as a link between the political elite and oligarchs and to guarantee that the latter would stay away from power. Abrahamyan’s key formula was “pay taxes and live in peace.” His role in the previous elections will not be forgotten but the next electoral cycle requires different players. What Sargsyan needs in the next year and a half is a “comfortable” premier. Abrahamyan had certain political ambitions. Karapetyan also has some but he is Sargsyan’s man. In the spring 2017 Armenia will turn into a parliamentary republic, where the leader will be the prime minister. Sargsyan, who will have to act as President till 2018, does not want to turn into a “lame duck.” This is why he has selected Karapetyan, who is also from Nagorno-Karabakh and had common business with Sargsyan in the past. 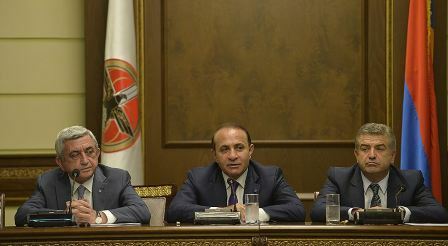 Sargsyan and his men have the example of Georgia, where a nominal president was unable to co-exist with a real prime minister. In order to avoid this precedent, they need to act. The coalition with a “junior partner,” Dashnaktsutyun, has significantly reduced the risk of the Republicans’ failure during the next parliamentary elections. Now their priority is to optimize the resources and to put right people on the chessboard. For ordinary Armenians, the appointment of General Ohanyan would be more inspiring. Even though Ohanyan is also part of the regime, he enjoys respect among the Armenians. But now he is expected to be named as Secretary General of the Collective Security Treaty Organization. This is good for both Sargsyan and Karapetyan. In general, the policy of the Armenian authorities is “incrementalism” – a wish to live till the finish. But that personal finish (retirement with a multi-billion account) is not a finish for the country and the people. What Sargsyan’s men want is to live till the spring 2017 and then till the winter 2018. This is their policy. “Reforms” to them are just some personnel reshuffles. Having no strong opposition, which could keep them in form, they are relaxed and unable to make brave decisions. This is the triumph of the policy of opportunism.